Aston Villa: Bunn; Clark, Lescott, Toner; Hutton, Sanchez, Westwood, Gana, Bacuna; Sinclair, Ayew. 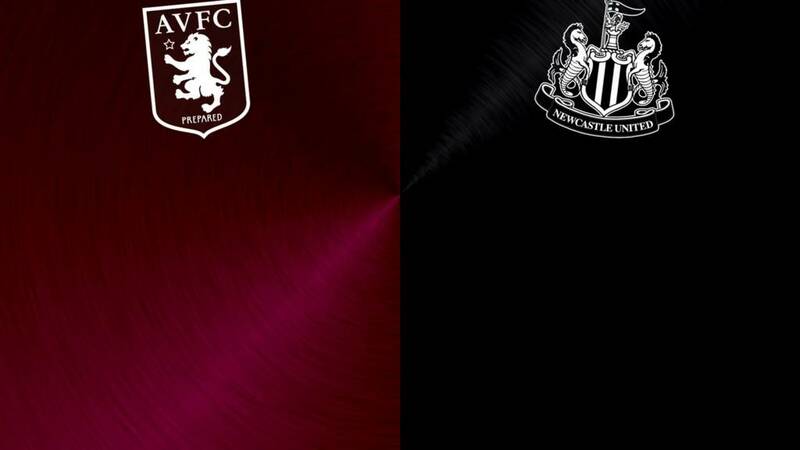 Newcastle: Darlow; Anita, Mbemba, Lascelles, Dummett; Tiote, Colback; Townsend, Sissoko, Wijnaldum; Cisse. "Newcastle didn't do enough today to win the game. Newcastle knew today was a game that had to be won, but they were not bright, not direct and did not put Villa under a great deal of pressure. "A draw is a fair result, because Newcastle did not ask enough of a side already relegated. Many people said it would be easy today, but it's only easy if you do the job right. Newcastle didn't do it right." For Aston Villa, it is a first point since 6 February. For Newcastle, it is two very costly points dropped. Thanks for your company; a full report will be online shortly. It has finished at the Stadium of Light. Sunderland have beaten Chelsea. Newcastle drop into the relegation zone with one game to play - against Tottenham. Sam Allardyce's side have a game in hand, though, against Everton on Wednesday. If they win it, Newcastle will be relegated. A bad day for Newcastle. As it stands, they are slipping into the bottom three. Sunderland are beating Chelsea 3-2, where they are still playing. ...but Townsend's effort is straight at Mark Bunn. Newcastle's survival chances are receding here. Shades of 2009. Newcastle fans have hands on heads. Newcastle, belatedly, are applying pressure. They have a corner... Andros Townsend takes it, but Carlos Sanchez heads out. Sunderland are still winning 3-2. A point is not good enough for Newcastle here. Brilliant defending by Ciaran Clark. Aleksandar Mitrovic tees up Georginio Wijnaldum to blast at goal, but the Villa man gets his body in the way. A point-saving intervention, perhaps. Maybe a degree of pride salvaged too. Into six minutes of stoppage time at Villa Park. This is desperate for Newcastle now. Aleksandar Mitrovic has added a little spark to Newcastle's attack, which was noticeably absent when Papiss Cisse was on the field. But even though Mitrovic is getting on the end of crosses, he cannot convert one as yet. This time it's Chancel Mbemba crossing from the right, and the Serbian rises among the Villa defenders to head wide. If you're wondering why Villa's fans picked the 74th-minute for their beach ball protest, by the way, it is because the club were founded in 1874. "If Newcastle go down because they don't get a win at Villa then the Magpies will know it's all their fault. "Today, Villa's players are giving it a go and are passing their way around and through Newcastle. The Magpies must pick things up." Alan Hutton charges down the Villa right into a clutch of inflatables, somehow deliveringa cross that is cleared. Team-mate Carlos Sanchez is then hurt after being caught by Moussa Sissoko. The midfielder limps to his feet after treatment, and is fine to continue for now. Here comes the 74th-minute protest. Villa's fans throw beach balls and balloons on to the pitch. Referee Bobby Madley has to halt the game while stewards attempt to clear the field. We're back under way after a brief stoppage. There was a chance for Newcastle amid all that drama at Sunderland: Georginio Wijnaldum swung a shot goalwards after finding a little space inside the penalty area, but Mark Bunn got down well to save. "You're going down with the Villa," chant the Newcastle fans. Another chance for Newcastle: Aleksandar Mitrovic climbs high to meet a left-wing cross, and directs his header just wide. The game is opening up a touch. Not much, but a touch. It is not good news for Newcastle. Sunderland have scored two in quick succession to lead. Fabio Borini gets the equaliser against Chelsea. before Jermain Defoe controls and finishes expertly to make it 3-2. The game in hand for Sam Allardyce's team is on Wednesday against Everton, who are nobody's idea of a team in form right now. It's not Wijnaldum coming off, it's Cheick Tiote. Ayoze Perez is on, with Rafa Benitez making an attacking change in an attempt to turn one point into three. Villa forward Scott Sinclair, who has had little impact this afternoon, bursts on to a through ball with hope of a breakthrough, but is just offside. In any case, Newcastle keeper Karl Darlow is quickly off his line to block. The Villa fans are making a lot of noise now... The word in the stadium is that they are doing so as they prepare for another walkout in protest at the running of the club. It has started raining, and the wind has blown on to the pitch a few of the balloons that had been cleared to the sidelines by the stewards.